Reading the forums at Basenotes, I came across a thread about a new indie house called Slumberhouse. We fragrance lovers are an interesting lot, and many of us have strange and unique tastes that are far from the mainstream; so when I saw the people posting passionate opinions, both loving and hating the different fragrances, I knew this would be a line worth exploring. Of the six samples I ordered, all of them inspired extreme reactions – either passionate love or respectful distaste. Slumberhouse fragrances are unlike anything else out there, with unique formulations, creative structures, and strong concentrations. While not for the faint of heart, if you enjoy something creative that will serve as a personal signature, this line is worth exploring. Perfumer Josh Lobb explained why Slumberhouse is such a unique fragrance line. Ron Slomowicz: How is the Slumberhouse set up? Is it a group of young gents or are you flying solo? Josh Lobb: When it started, it was several people. I was the only one making the fragrances, but it was group of people that were involved in it. Eventually we all realized that where we wanted to take things was different. We are all friends, but one of them started a clothing line and that was a part of it. The idea was to be something greater than the sum of the parts. We wanted it to be a line of clothes and fragrances, a variety of things for a certain individual. It didn’t really work the way that we had hoped, so right now it is just me. RS: So like a collective? Josh Lobb: Yes, essentially a collective. We had a place where we were doing everything, but it eventually reached a point where we felt that maybe down the road it would be a more feasible option. Since we are all getting up on our own two feet and getting things going, it was more logical to develop our brands as individual entities. It would have been a little too confusing to have it put out as one thing. RS: How are you trained as a perfumer or how did you discover how to make perfumes? Josh Lobb: I am not trained at all. I am probably the most untrained and unqualified perfumer that there is out there. I trained myself basically by experimenting, I am completely self-taught. I think that is probably the only way that I could have become a perfumer since I really didn’t care for fragrance at any point of my life. I couldn’t stand to be around people that wore fragrances. It was only because a lot of people just wear fragrances that they have access to. I think that had I been trained professionally, I never would have come across the unique aspects of independent perfumery and a more unique approach that can be taken. RS: How did you learn how to mix oils into a perfume or how to layer the absolutes and extracts to come off as base notes and top notes? Josh Lobb: It was all experimentation; it was really trial and error. Most of my perfumes don’t actually contain any top notes. I don’t like to use them. Regarding learning things, I can’t really say that I have learned anything. I have come up with a method to make my perfumes. 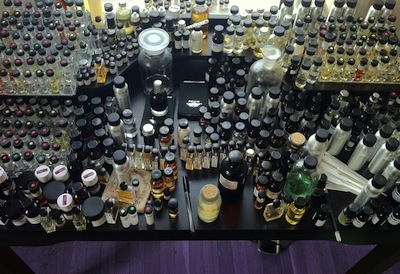 When I first got into it, I read a little bit about making perfumes. A lot of it was a really old school method of a fragrance pyramid and a certain percentage of base notes, heart notes, and head notes. I didn’t care to do it that way; I wanted to do it my own way. Had my perfumes come out and nobody liked them, you would consider me an untrained perfumer. I wouldn’t say that I am necessarily trained but I do have a method. RS: How do you source your materials, what you use to make your perfumes? Josh Lobb: I get them all over the place now, but I used to just have a few resources. There are a few small suppliers here in the west coast that sell small-scale quantities of ingredients, both synthetic and naturals. As I began to make greater quantities of perfume, I actually had a lot more access to the ingredients since I bought larger amounts. With more sales and more perfume being made, I had greater access to the various ingredients. Now I get them from many of the big suppliers that some of the large perfume houses get them from. It is kind of nice to have that stability. It is definitely something that I could not have done at the beginning of this. RS: How much do you think the environment of Portland affects your fragrances and your inspirations? Josh Lobb: It is hard for me to say without any other reference points. I will say that after living in Portland for about 15 years, there are elements of the city that have rubbed off on me. When I came here, aside from having no interest in perfume, I really didn’t know who I was as a person. I was just meandering around like a typical twenty year-old that has no purpose or ambition. I think being in the city has allowed me to open my eyes to different things and to always go back and revisit things that I initially didn’t care for. Perfume is one of the things that I really didn’t care for and somehow going back and revisiting that I realized that I liked it. That is something that I probably would not have been given the chance to do had I not lived here. RS: What’s the first fragrance that you made? Josh Lobb: The first fragrance that I made was called Sova. It was the first one that I ever put up on Etsy, which is where Slumberhouse actually started. I made a very small amount of it; it was a really unique fragrance. I have been working on it again and hopefully it will be out sometime later this year. That was the first one that I did for Slumberhouse. RS: I have to ask, the names Soma, Vikt, Grev, and Mur, where do they come from? Josh Lobb: They mean absolutely nothing! I feel that when you name a perfume, the person who is going to smell it already has an idea in their head of what they are supposed to be smelling. I don’t really care for that because I think that the interpretation of the fragrance should be completely up to the person who is experiencing it. I felt that giving very nondescript names that have no meaning or purpose was a good way to facilitate to where you almost have a blank slate when smelling the fragrance. I actually don’t like to give out a list of notes when I release a perfume but there is a point where you have to give out some sort of indicator of what the fragrance is or else people would be hesitant to even buy it. RS: You obviously don’t care about labels, but would you consider yourself a natural perfumer? Josh Lobb: No, I actually started off using many aroma chemicals, synthetics, and eventually I started to get more and more into naturals. Only the absolutes though, I really don’t care for essential oils. I don’t think that they are very interesting. The absolutes are really great, there is nothing like them. There are definitely drawbacks to using them though. They are very expensive; they tend to vary incredibly from batch to batch, so keeping consistence with the fragrance that is dependent on naturals is really a full-time job. With every new batch that you make, there are always going to be slight differences. There is additional time in trying to reduce and minimize those differences, it is a very in-depth process. Lately I have been veering back towards synthetics, so I wouldn’t say that I am a natural perfumer. I really wouldn’t aspire to be either; I would never want to limit myself to the kinds of ingredients that I use. RS: Though one of your more recent fragrances Norne is all forest absolutes, is that true? Josh Lobb: Yes, that one is completely natural. There is not a single synthetic or essential oil in it. It was created over a period of close to eight months. I was very much immersed in natural ingredients, not only your typical absolutes, but finding rare absolutes and sourcing them from different suppliers, companying and seeing which one worked best. It was a good experiment but it definitely wasn’t symbolic of any sort of direction that Slumberhouse was heading. I had never tried it before or seen many perfumes that are only absolutes. It was a challenge for me. RS: I was thinking that maybe the forests of Portland could have been an inspiration for Norne, is that the case? Josh Lobb: No, the inspiration behind Norne is related to a genre of music that came out of Scandinavia called black metal. It is kind of a campy genre nowadays, but there was a time that it was a very unique genre, and with it comes a very unique way of thinking. I wouldn’t say misanthropic or nihilistic, but kind of isolationist and nature plays a heavy part in that. I wanted to create something that was kind of poetic and dark, like an Edgar Allen Poe type of morbid, nocturnal, dusky feel to it. That was the primary inspiration behind that. RS: Since Norne was inspired by black metal, do any of your other fragrances have musical inspirations? Josh Lobb: Actually pretty much all of them do. I listen to a lot of different things, from old timey jazz to experimental things like the Rachels or the Clogs, to hip-hop; I really love hip-hop and turntabilism. Music always plays a heavy part. It is always playing when I create a fragrance. It is just one of those things; it goes hand and hand with scent. Music is a very important part. RS: I read that someone described that your fragrance as “the brand has an overall post punk, DIY, indie rock vibe that’s irresistible”. Josh Lobb: That is really flattering that people respond to it that way, and that they see it as being something that is different, outside the mainstream or even outside of smaller perfume houses. I try not to put too much of an identity to the fragrances. I want to keep it as much of a blank slate as possible so it doesn’t feel like it is a brand that is pigeonholed. I would never want Slumberhouse to be associated with luxury, or with being a ladies man. I don’t ever want people to feel like it is a certain type of perfume. I want it to be open to the person that is smelling it and let them decide how it makes them feel. RS: What has been your most popular fragrance over time? Josh Lobb: It’s hard to say because with each new release, they sell really well. I would say Jeke, Rume, and Norne have really sold well, those three do great. Vikt does okay, and I would say by far Grev sells the fewest. It is one of my favorites though and I have no desire to stop making it. I had to stop making one called Ore, it was by far my most popular one but some of the ingredients were discontinued so I had to stop making it. RS: I noticed on your site that some fragrances are limited editions and some are the big five that you always sell. What transcends from a limited edition to a mainstream? Are limited editions in process or where you are going? Josh Lobb: It is almost as if the fragrances that are put out as limited are in an incubation phase, where I am really confident in the recipe. I want to get it out there and see what people think, but I don’t ever want to flood the market with too much. I see a lot these perfume houses that are as old as Slumberhouse, even newer and there are thirty or forty fragrances out. I think that is overwhelming for your typical perfume fan to come across a new house and now there are forty perfumes to go through. If that was me, I would give up before really starting. 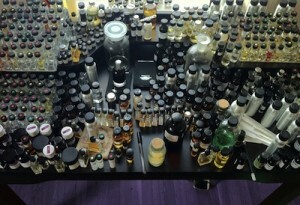 I think that it is very important with all the perfumes that are released each year to focus on quality over quantity. When these limited releases are put out I really just want to make sure that it’s something that people respond to well and if they do, I want to keep it available. I don’t want to keep on creating scents and have them go away in a couple months. I try to keep the limited ones available as long as they can. RS: Kind of like in the DJ terms, the limited edition is like the white labels and the five other ones are like the mainstream commercial releases. Josh Lobb: Yeah, I am conscious about putting too much too soon out into the public. I am still a young perfumer, I learn so much every day and I feel like my best days are ahead of me. I don’t want to put too much out and have people formulate an opinion about Slumberhouse or have a negative one and dismiss everything that I do in the future. I try to focus as much as I can to create a quality fragrance first. RS: It seems like every perfumer has their signature, like if you smell something that is a Serge Lutens fragrance, that is a Chanel fragrance, or a Slumberhouse fragrance, do you think you have a signature? Josh Lobb: Probably, I think in every fragrance that I have done besides Norne there is some type of tobacco. Notes aside, I really try to go for something that is deep, dark, and kind of sweet, really comforting in the skin at the five-hour mark. That is really a more important time for the fragrance than the first part. That is why I don’t really care for top notes. I think that top notes should be totally disregarded in perfumery; they have absolutely no place in what I do. I think that they are misleading and I don’t see any purpose in putting something in a perfume that will last only a few minutes. The reason I don’t use top notes and the reason I keep the concentration at a fairly high level is because I think that these fragrances are best experienced after they have been on the skin for a few hours and sort of melted into your skin and you have the sweet, dark, smokey smell. That is the thing that I initially wanted to create when I got into making perfumes. RS: Mainstream perfumery at the department stores is all about the top notes to entice you to buy it; you are selling more of a substance, which means that you are completely outside the mainstream. Josh Lobb: I still can’t understand why anyone uses top notes. It doesn’t make sense that they would even exist in a perfume that is going to be with you for eight hours but they are only along for the ride for the first twenty minutes if you are lucky. Top notes evaporate really quickly. I like to experiment with them, ill test them out and I’ll buy them to see how they interact with other things, but typically I don’t ever like to use them. I don’t think I ever have. RS: Just so you know, some words that have been bandied about regarding Slumberhouse are balsamic, resinous, clove, pine, and tar; that they must be Slumberhouse’s go to notes, or signature notes. Josh Lobb: I love those descriptors of balsamic and resinous. I like really deep, dark, masculine, woodsy kind of fragrances. I like fragrances that inspire images of gentleman sitting around a fireplace with cigars and whiskey, sort of refinement like that. I have heard people say that all of my fragrances have a lot of clove, which is just how people smell them. Very few of my fragrances use clove, I think that a lot of times people will confuse things like nutmeg or allspice with clove. It basically all comes down to how one interprets it. I actually use more allspice in my fragrances than clove. I don’t dislike clove, I love it. I think that it is very evocative of a certain time of year and smokiness, it compliments my fragrances well. I must say that with a lot of my fragrances I am a huge fan of Iso E Super. I know that it is kind of a divisive chemical and a lot of people don’t like it or can’t smell it in a fragrance. I think that it is a very dynamic molecule and should be in every fragrance. It does a lot to create a very rounded, warm overall halo around the scent and I think that it’s fantastic. RS: One fragrance outside your house if you haven’t smelled, I recommend that you try Black Afgano from the Nasomotto line. Josh Lobb: I have tried that. RS: When I first smelled your fragrances that was my reference. Josh Lobb: It is definitely in the same line. It has a dark color and it’s definitely a tobacco kind of black agar scent. I don’t wear it that often, I hardly ever wear fragrances. It can interfere with the work I do. People ask me if I wear my fragrances much but I really don’t. Maybe as someone who has dealt with music, you can understand. If you are a musician and you have spent months in a studio recording an album, the last thing you want to do is go home and listen to your album. By that point, you are so intimate with the composition that you kind of want to forget about it so that a few months later you can smell it and have the same reaction that someone who had never smelled it would have. RS: Before you release a fragrance, how do you test it? Do you have other people wear it to give you feedback? Josh Lobb: I used to do that. I had a small group of friends that I would give samples to and have them wear it for a few weeks and tell me what they thought. I got to the point where although I appreciate the opinion of others, I don’t ever want the work that I do to be influenced by anyone other than myself. I know that is probably a selfish thing to say but I think the best work comes when there is no interference from other people and the idea can be expressed and communicated in a way that is very pure. That is one reason why I started to put up limited scents. Instead of knowing what I should put out I can just release it and if people respond well, great and if not that’s fine. I really don’t care to let people smell things before I put them out. RS: That makes sense. I read on your site that Brosse was created under unique circumstances. I am wondering what those unique circumstances were. Josh Lobb: I might lose some fans for this! I am quite a big fan of hallucinogens and psychedelics and I think that a lot of these things can be used in a way to create on a different channel than you otherwise would. With that fragrance, I was composing it primarily under the influence. I am really happy with the result; it is one of my all-time favorite fragrances. There were a lot of strange nights and bizarre moments; it was really unique to create fragrance being completely outside of yourself. I am actually looking forward to doing it again. Josh Lobb: To be honest I am not even sure what outsider art is, I do think that perfume is art though. When I got into it that was a real personal thing for me, I didn’t want any outside influence or anyone to pervert what I was doing. I was going through other perfumers that have created scents that I really like and Calice Becker the perfumer who did Back to Black which is a fragrance that I really like. I was listening to an interview with her and she was saying that as a perfumer she was not an artist but a designer. She said that she did not create out of thin air, but for the audience. I was so disappointed to hear that. I don’t want to sound like I am criticizing her because she is so talented, but that is definitely not the approach that I take to perfume. I think it definitely sets the tone for how one does their work. When someone says that what I do is outsider art, although I don’t know what it means I take it as a compliment. RS: As a DJ, I understand where that is coming from though. I can be DJ and only play really off the wall music that only I like, but no one would ever want to come listen to me. Josh Lobb: Exactly. It’s to the point that if you are only spinning stuff that other people like and you hate, it would be good for the people and the club owner but are you enjoying it? If you are doing it day in and day out, weekends and after months of doing it, you may start to wonder what you are doing spinning music that you are not fond off. I think it is sort of the same thing with perfume. I worry that if I become too focused on what the people want, then I become like Calice Becker said, I am creating for the audience rather than creating out of my own imagination. I think that is the difference between a lot of perfumers. RS: With that being said, you are growing a fan base out there. There are people following you, how are you reacting to that? Is it odd, are you getting used to it? Josh Lobb: It is very odd and very flattering. I can’t even put into words how much it means to me. This is my full-time job now and it’s all I do, I am doing well at it now. I could not be more appreciative of that. There is also a stress that comes with it. It’s not that I worry about letting people down, but I think when you are creating things it is important that the people who have an affinity for what you are doing, never find themselves bored. I think it is a good thing to constantly challenge yourself when you are creating things and to never fall into a pattern of repeating yourself. Again, it is the same with music, if you are a musician and you are putting up the same record over and over, you are not going to have much of a life span. It is the artists that are reinventing themselves that are successful. I am not a fan of Madonna but she is a good example of someone that consistently knows how to reinvent themselves. Lately it is somewhat insincere but then again to a degree, all art is. RS: With that being said, what is coming next? What are you working on right now that is new and different? Josh Lobb: Right now, the fragrances that I am working on would probably surprise a lot of people. They are definitely not as crazy. Right now I am really focusing on wearability. Make no mistake about it; I love the fragrances that I have made so far and I’ll keep them going for as long as Slumberhouse is around. I do want to focus on perfumes that are very wearable and could be more versatile in different situations. 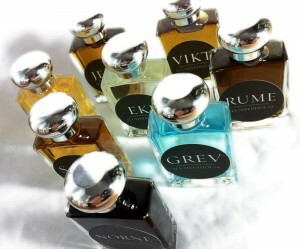 I think that a lot of the fragrances that I make right now, people are hesitant to wear them to work, or a meeting, etc. I would say now my approach is more streamlined and somewhat different than the perfumes that I have put out thus far. RS: It is interesting that you say that you are going in this direction because you talk about doing it yourself and being out of the box, to trying to create something that is more acceptable, it seems like an oxymoron in a way. Josh Lobb: You’re right, it totally does. I think if people hear that they will expect that I will be putting out things that smell like everything else. They are still incredibly unique, I have been using things that I don’t see many perfumers using. If anything, they are even more bizarre now with a very easygoing uniqueness. It is not so blunt and in your face. When thinking of perfume like a texture, I think that some of my perfumes have been very rough and spiky. There is a texture to them that is not very smooth and warm in the sense that it can’t be worn in many different instances without raising too many eyebrows or drawing too much attention. I think some people shy away from that. There is definitely a weird sort of paradox there with me not wanting to follow anyone’s lead and not wanting to go along with the mainstream yet creating things that are more wearable. Wearability and uniqueness are not opposed to each other. I think there are a lot of things that people haven’t smelled yet that they would actually enjoy but for whatever reason they really have not infiltrated the mass market yet. RS: Give me an example of one of those scents that you think the mainstream has not discovered yet, please don’t say Oud. Josh Lobb: One of my favorite to use right now is called blue lotus absolute. It’s a note that you will see listed, but the first thing you should know is that most notes list are complete frauds, they mean nothing. Though an actual ingredient will be listed, what they are really referring to is either an accord or a synthetic that represents that note. Blue lotus is expensive, around $500 an ounce. For that reason alone, you probably don’t find it in any mainstream fragrance produced on a mass scale. It is very rounded and refined. It is sort of a floral for people who hate floral, a very unique note. I think a lot of people have seen the word lotus thousands of times when looking at perfume descriptors. I think that if they smelled it they would quickly realize that they have not actually smelled a real lotus absolute, not just blue lotus but pink and white as well. They are very specific and very rare to come by. RS: With that being said, one thing that I like about your line is that your price points are accessible; they are not completely off the wall obnoxious. How are you able to maintain these high quality expensive ingredients and keep your price point so accessible? Josh Lobb: With Norne, I actually lost a tiny bit of money. I am not a businessman at all; I am really bad when it comes to crunching numbers. I created the fragrance and started selling it, out of curiosity I did the breakdown. I shouldn’t say that I lost money but I am pretty much breaking even on that one. It is too late now. I think that some of the things that help me are that I don’t spend any money on advertising; I have never once bought a single ad. I think that is tacky and I have no interest in advertising Slumberhouse like that. I don’t have commercials; I don’t pay for celebrity spokespeople or have boxes for my bottles. There are a lot of things that I choose not to pay for that allows me to price these at a lower price point. Another thing is that I understand these are tough times for people and I understand that perfume is a symbol of luxury or decadence. There has to be an element of keeping it real with your customers and maintaining a sense of integrity with what you’re doing. I do like to sample certain new releases that interest me and there are brands that I like. I notice with a lot of them that the perfume itself does not at all reflect the price that they are asking for. Some people are fine with that but for me that is not really what I want people to identify Slumberhouse with. RS: With Norne, I smelled a sample and if any other house would have sold that it would be a $300 bottle, easily. Josh Lobb: It is one of those things that at this point with what I am doing with Slumberhouse it is much more important to focus on what I am doing rather than making money. I really don’t know how to market myself anyway, so I just chose not to even bother with it. Part of what has made this a great experience and the reason people know about Slumberhouse is because of the customers themselves. They will go and tell their friends or write on a blog or message board and people will find out. That is why I am so loyal to my customers and why I want to keep my prices low. I think that is a two-way street, if you allow your customers a chance to consistently check out your stuff without breaking the bank, you will keep them around longer. I just feel that it is the right thing to do. I am sure that I could double the price, sell a quarter amount of the bottles, and have an exclusive reputation but that is really not of interest to me. RS: You mentioned some other perfumers that you like; can I ask who they are? Josh Lobb: My favorite perfumer would have to be Christopher Sheldrake. I think that he is on completely different level. I don’t think that anyone comes close to the work that he has done. I haven’t smelled many of his new releases, the last ones that I smelled were around 2007, but there are so many fragrances that he has done that I admire. He is by far the most interesting. I mentioned Calice Becker, her style is not really my style but there is such grace and beauty to them that I could just wear them around my house. I think that she has a unique gift for having her own style. For other perfumers, I don’t know his name but the guy that runs Parfumerie Generale has done some really amazing scents as well. I would say that those three perfumers are people that I would love to sit down and have a dinner with. RS: The Parfumerie Generale guy is Pierre Guillaume; he has a newer line called Phaedon you might want to look into. With what you said about Sheldrake can I take a wild guess and say that Cuir Mauresque is one of your favorite fragrances? Josh Lobb: No, it seems like it would be a fragrance that I absolutely love. I hate when people do this, but it reminds me of a certain type of hand soap that they had in my school. It smells identical to it, I am sure that if I smelled it side by side now there would be much more of a difference. Every time I smell it, it has that identical smell and I can’t shake the association. I would like to like it though because I am a huge fan of leather scents. It is a very unique approach to leather and even though I don’t like it, it is still a completely masterful fragrance, it is so perfectly done. There are very few that he has done that I disliked. RS: I’m just curious, let’s say that Christopher Sheldrake or Pierre Guillaume called you and said that they liked what you were doing and wanted you to work for them in their lab, how would you respond to something like that? Josh Lobb: I would do it in a heartbeat. I would do it with the knowledge that I can do whatever I want in this life and nothing would restrict me. I could always come back to Slumberhouse in the future but I think that it is always wise to keep your ego in check. Although it is a critical point for Slumberhouse, nothing in this life is more important than experiencing and learning. If you have the chance to learn from someone that has knowledge that is vastly superior to yours, I think that it would be a huge mistake to pass it up. If I ever had the offer to get training from one of those guys, without a doubt I would jump on that. RS: You said that it is at a critical point, what does that refer to? Josh Lobb: It is to the point now that Slumberhouse is not a tiny operation that I am barely struggling to keep afloat. If I stopped for a month, everything would fall apart. It is running along at a good pace but I think that it is a critical moment because a lot of people are discovering Slumberhouse and writing and wanting to check out what I am doing. To stop that, go off, and train somewhere would put a halt to that. It is a very fertile time for the company. It would be a sacrifice but I think that it would be worth it because at any given point you can always go back and create a perfume, even if your company goes away. If Chanel and Serge Lutens went down, Sheldrake could start a company out of scratch and with his talents within a few months he would be fine. While I am very appreciative of where Slumberhouse is at, I don’t want to think that it is more important than anything else. I think that learning and experimenting will always come first. Josh Lobb: Just thank you! I wouldn’t even want to say anything; I would like to listen to what they have to say to me. I’d want to hear how the perfumes affect them, why they like them. I love it when people write and email me a YouTube video to a good song or a recipe that they like for dinner. I am really into the personal relationships that I have with my customers. I am not a very interesting guy, so if you want to communicate with me, tell me something about yourself. RS: I can assume that if it’s a twitter from you, your blog or website that it’s all you doing it, you don’t have other people working for you. Josh Lobb: No, it used to be a couple other people, but now it’s completely me. Wow, this interview was really interesting and helpful!. I have been reading about Slumberhouse scents on several different blogs this past year, but didn’t know anything about the perfumer or company. I also saw several of Josh’s perfumes for sale at a store here in Seattle, but passed them by as there was a lot of other brands I was trying on already. I’m excited to go back to the store and try Slumberhouse. My wardrobe consists mainly of incenses, resins and mosses, so I’m really intrigued. Fantastic interview! I’m really excited to smell the entire Slumberhouse line. I am a huge fan of Slumberhouse. I found your interview while searching google and found it very enlightening. Am also a big fan, i found your fragrance at the roullier white boutique in London, I was blown away by the uniqueness of norme,jeke and sova.